Blizzard outdoes itself with the StarCraft II Collector's Edition: how can $99 feel like it's too little to pay for this much awesome? As someone who has bought all of the collector's editions for World of Warcraft and its expansions, I was beginning to feel a little bit jaded. Sure, the art books are nice and the behind the scenes DVDs are interesting, and I never grow tired of someone in WoW asking me where I got a mini Diablo as a pet, but I was starting to wonder whether all of that swag was worth the price tag. 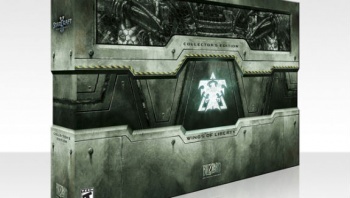 And then Blizzard comes out with the details for StarCraft II: Wings of Liberty collector's edition and I start to giggle shamefully like the fanboy I am. I don't even care that it costs a hundred bones. Do want. There's no date set yet, but the beta has been out for a while so we may get a release date soon. Wings of Liberty is only the first of three StarCraft II titles and focuses on the Terran race, with a Zerg and Protoss campaign to follow. Retailing for $100 is a bold move, considering other CEs top out around $80-90. But some inexplicable reason, I think this one might be worth it. I'm just pissed that I'm going to have to buy a total three of these for StarCraft II, as I'm sure there will be special editions for Heart of the Swarm and Legacy of the Void. Damn you Blizzard for being so awesome!